We match marketers to their future customers. Through our large array of media products, Convince & Convert Media helps companies increase leads and generate sales by putting the right message in front of the perfect audience. Click to view our 2019 Media Opportunities Guide. Our Convince & Convert digital magazine is one of the most popular digital marketing resources on the planet, and has been named the best content marketing blog and #3 social media blog around. We deliver extraordinary value and a huge audience to our sponsors and guest contributors. Our network of podcasts delivers hyper-targeted audiences in a compelling weekly format. Our ON email is extraordinarily popular worldwide among marketing professionals, and we generate hundreds of leads for our partners each time we send an email on their behalf. We also work with our partners and sponsors on joint webinars, ebooks, events, retargeting ads, and a variety of other executions. Let’s discuss what works best for you. Current sponsors include Salesforce, Oracle, Sprout Social, Cision, Sparkcentral, Vidyard, RivalIQ, Uberflip, and many more. How can we help you? View or download our 2019 media kit here. To talk options, please email Chris Anderson. Your company IS a media company (or at least it can be). 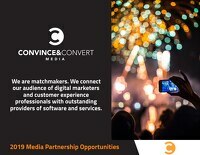 Our media division and our consulting division converge to provide outstanding digital media advice and counsel to major companies like Hilton, Cisco, and The Grand Ole Opry. How can we help you generate more leads and sales? Or how can we help you create and manage your own digital media products? Contact us and we’ll be in touch immediately to set up a no-obligations, pain-free conversation. View our clients and case studies. Jay Baer and Convince & Convert sent a dedicated email to their list about our research study, and this one email more than doubled our average weekly lead flow. When Jay talks people don’t just listen, they take action. With the Convince & Convert blog, emails, and podcasts, Jay Baer has built an amazingly smart, engaged, and responsive audience. If you’re marketing a product or service to marketers, you would be well-advised to make C&C part of your advertising strategy. It has certainly been a successful part of ours.